The 1621 Thanksgiving celebration between the Pilgrims and the Natives of North America. 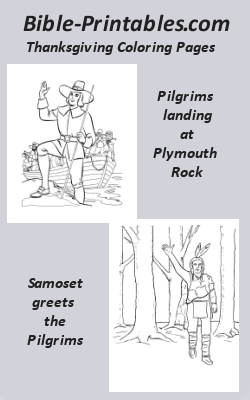 The story (told in coloring page pictures) of how the Pilgrims suffered and came to North America aboard the Mayflower. Secular Easter Coloring Pages - A large selection of Easter coloring pages featuring Bunnies, Eggs, Chicks, Ducks, Lambs, and other "cutsie" Easter / Spring images. Printable Thanksgiving history Coloring and Activity Pages are fun to use in Sunday School Classes and Vacation Bible School and make teaching lessons fun and easy! Printable Thanksgiving Coloring and Activity Pages are fun to use in Sunday School Classes and Vacation Bible School and make teaching lessons fun and easy!